If Mary Poppins measured author Kevin Henkes, her ruler would likely say "practically perfect children's author in every way." Time after time again, Henkes releases wonderful, thought-provoking books for kids. His latest string of picture books speak of gentle, seasonal days outdoors, with beautiful illustrations set in square or circular borders alternating with full page bleeds. First there was Old Bear, the story of hibernating bear that has vivid dreams and awakens to a gorgeous spring day. Then, last year came My Garden, a magical book about all the things a little girl would love to plant in her garden. 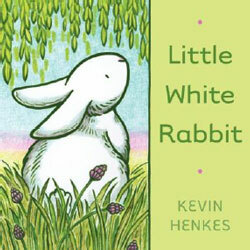 Just last week, he released another lush, imaginative springtime book, Little White Rabbit. Hippity-hoppity! An inquisitive little white rabbit hops around the forest one gorgeous spring day and wonders about all sorts of things. What would it be like to be green, or tall, or not be able to move at all? The rabbit imagines all sorts of scenarios until he hops past a cat. Scared, he heads straight home. Back safe and sound, he knows there's one thing he never has to wonder about. LOVE! ♥ He knows without question that he is loved! With so many books about bunnies already in print, it's hard to believe that Henkes' new book could stand out. But it does. His simple story stirs the imagination, and the adorable little bunny practically bounces off the page with a fluffy cuteness kids will adore. The colorful springtime illustrations of flowers, green grass, lush trees and colorful butterflies exude happiness and help melt away the winter blues. I wonder if it is a coincidence that Henkes chose to illustrate his rabbit under a green Willow tree for the cover picture? A tribute to his publisher, perhaps? 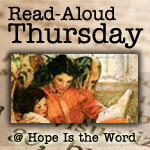 The text along with the vivid illustrations provide food for thought and help facilitate discussion. What do you wonder about? My daughter said she wonders what it would be like to be a cat. She also loves when the rabbit "wondered what it would be like to flutter through the air" and thinks it would be fun to fly with the butterflies like the rabbit. 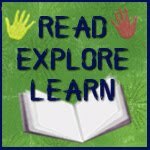 The book is short enough to keep a toddler's attention and beginning readers will find plenty to love about the story, too, including a repetitive, easy to read text. 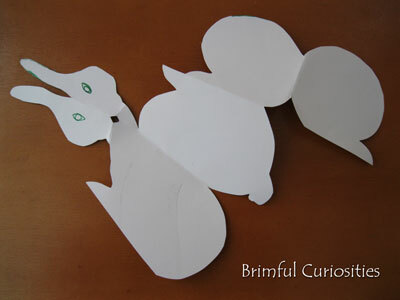 Under the Green Willow: "From the Studio, Kevin Henkes"
ART with Mrs. Smith blog has a cute template for a foldable bunny card. This template is the perfect art tie-in for Little White Rabbit. My kids loved folding their own 3D "little white rabbits" and had a great time making their rabbits hop around the house. While we didn't decorate the rabbits this time (the kids wanted them white), you could easily make and decorate cute Valentine's Day or Easter Cards (or celebrate the Year of the Rabbit) using this bunny template. My son later decided that his white rabbit was wondering what it would be like to be a superhero. 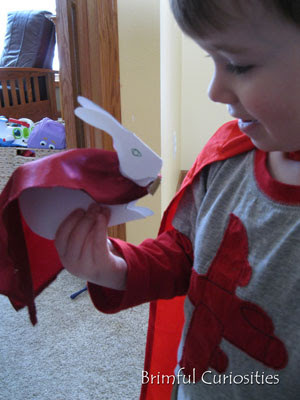 We found his rabbit a super hero cape in our doll clothes box. Up, up and away, little white rabbit! Oh my your paper rabbit is so cute! I love it! We are bunny mad in our house, so I think the book and the craft would go down a treat! This looks adorable! I think you're right--this belongs in an Easter basket this year! Oh my, that little paper rabbit is so cute. How adorable. I love it! Ahem... I somehow managed to comment twice there.. and now three times... Mmmh. sorry. You can delete all the superfluous comments. Sorry!!! I love that little rabbit. It's way too cute. Super Hero White Rabbits rock! I've really been enjoying Kevin Henkes' new style as of late. Looks like another winner! So cute! I have always been a huge Henkes fan so I'm definitely going to have to add this one to my collection. Thanks for another cute craft. I love the bunny has a cape. JDaniel would love a cape for his creatures. The book looks great too. That really would have been the perfect book! I wish we would have read it for our Chinese New Year activities. I am probably going to check it out anyway. We love Kevin Henkes. Thanks for the heads up on a great book for the Easter baskets. The paper craft is great. Feel better soon! I love this book!!!! 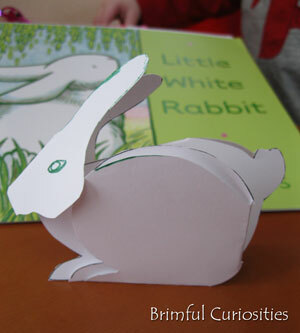 I'm going to post a slightly easier little green bunny craft for St. Patrick's Day. I'll link back here though so people can see your project too. Great idea.